This is a theatrical mentalism routine suited for parlor or stage. Jim has used this to give his audience chills for several years now. While best known for his close-up magic he has decided to finally share one of his pet stand-up routines. Imagine Confabulation with a serial killer theme. As sinister as this may seem, it is done tongue-in-cheek. The kicker is the thought-of card from the pocket and DJT’s clever handling with minimal props for all of this. Read review. Buy now and get one deck of Squeezers for FREE! It’s not required, but it is recommended having two to three decks of Squeezers for this routine. See SQUEEZERS. The magician shares with his audience a story from his college days. He informs them that a serial killer was making front page news at the time. The serial killer would strangle his victims and leave a playing card with each of the bodies. The brand of cards used are called Squeezers and thus earned him the nickname “The Squeezer”. 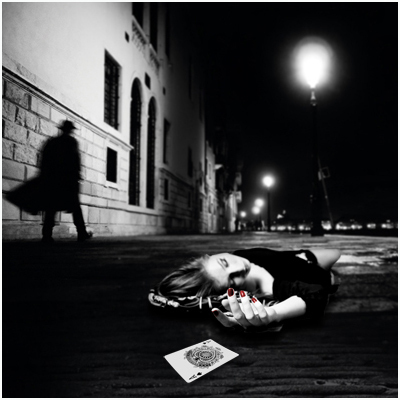 When the body count almost reached a full deck of cards the police called in a psychic to help them with the case. The magician informs the audience that to this day, the killer has never been caught. The magician, who dabbles in detection, and who is somewhat clairvoyant, decides to have a little fun, theatrically, to recreate some facts of the case. He calls upon a volunteer to help. The magician makes a prediction on the back of his business card and puts the card in plain sight. The volunteer is asked to name the first letter of the first victim’s name, their age and the state where the murder took place. The magician writes down their responses on post-it notes and sticks them to the volunteer for comedic effect. To everyone’s shock and awe when the magician asks the volunteer to read his prediction aloud it matches their responses exactly! The business card and post-it notes can be given away. The volunteer is asked to freely name the playing card that they think was found on the first body. The magician, with sleeves up, removes one playing card from his pocket and shows the back of the card. As the card is turned face-up it is seen to be the freely named card. This kills! DJT has used this to close many shows at places like the Magic Castle in Hollywood. You must choose your audience carefully for this one because it really freaks some people out. Once at the Magic Castle, a girl who helped DJT during the routine vanished from her party there and her friends hunted Jim down to ask of their friend’s whereabouts. The girl was never found that night and Jim barely escaped their clutches. This is absolutely true!